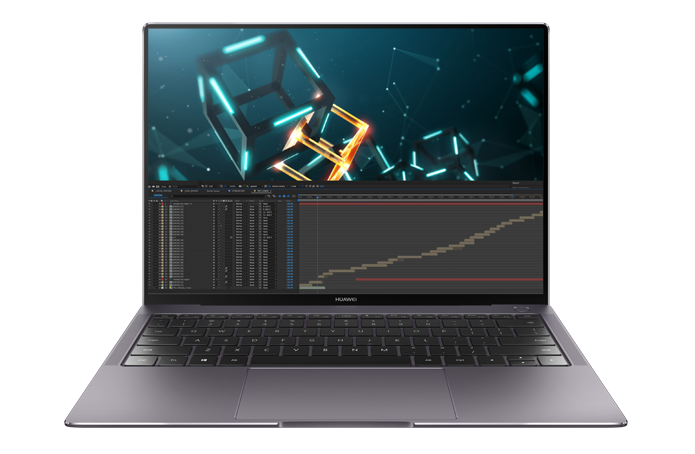 HUAWEI's first notebook with FullView design. 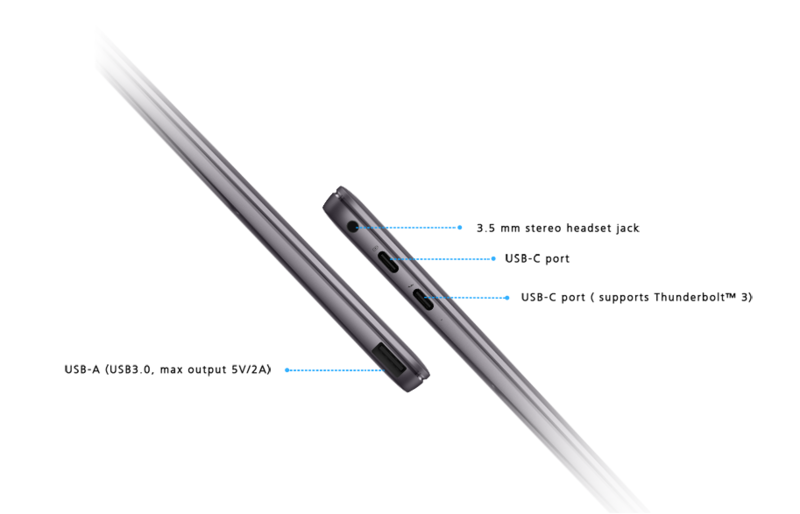 The 91% screen-to-body ratio creates a nearly borderless display, delivering a massive view on a small body. A revolutionary experience. A screen that captures the world. 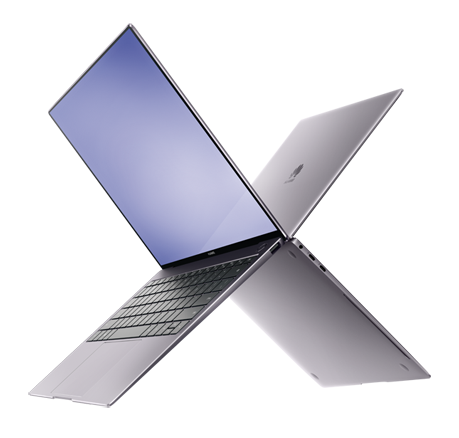 HUAWEI MateBook X Pro's 3K LTPS display comes with a remarkable 3000x2000 resolution, 260 PPI, 100% sRGB color gamut, 450 nits maximum brightness and 1500:1 contrast ratio. Immerse yourself in vivid details when viewing high definition pictures or watching 4K videos. Effortlessly scroll and zoom with HUAWEI MateBook X Pro's 10-point touchscreen made with ultra-thin Corning Gorilla glass and with an anti-fingerprint coating. Navigate accurately, freely, smoothly and intuitively with the touch of a finger. A professional notebook that's also portable. 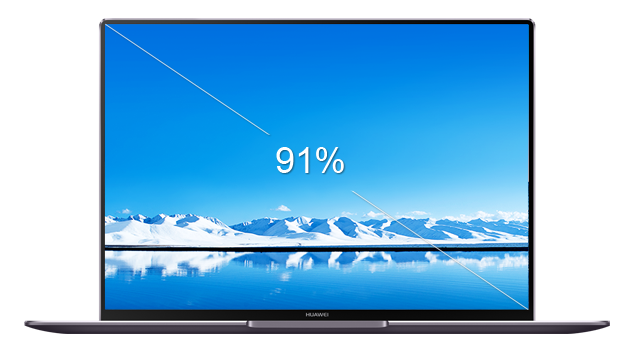 The 2.93lbs, 0.57" thin HUAWEI MateBook X Pro is ultra slim and light so you can take it to anywhere for work and entertainment. Stylish outside, powerful inside. The 8th Generation Intel® Core™ i7 8550U/ i5 8250U processor* boosts performance over its predecessor. It is easier and quicker to do more with power at your fingertips. Creativity and productivity unleashed. *Different configurations have different processors. Intel, the Intel Logo, Intel Inside, Intel Core, and Core Inside are trademarks of Intel Corporation or its subsidiaries in the U.S. and/or other countries. The NVIDIA® GeForce® MX150 graphics card comes with 2GB GDDR5,* ensuring faster image processing, smoother video editing and more stable gaming. Never limit your fun and imagination. *Discrete graphics card is only available on i7 configuration. *This data was obtained by Huawei laboratories using continuous local 1080p video playback, 150 nits brightness, auto-dimming off, system audio level at 67%, Windows Update off, OneDrive off, pre-installed applications removed. Actual battery life will vary depending on configuration and maximum capacity will naturally decrease with time and usage. Combining quad speakers and split frequency setup, Huawei and Dolby's superior design offers woofers with deep, resonant bass and tweeters with clear treble. Rich, crisp sound effects from all angles. The Dolby Atmos® Sound System minimizes distortion and captures details to create an immersive 3D sound experience. Quad microphones accurately pick up sound from 4 meters away. 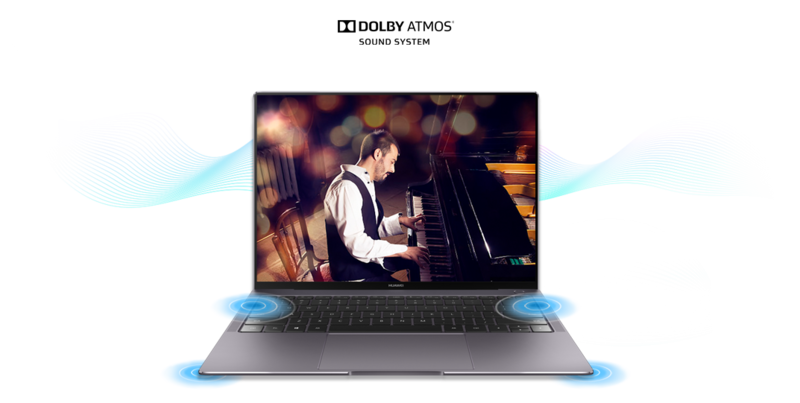 * HUAWEI MateBook X Pro also supports remote intelligent voice interactions and Microsoft translator for multiple users. 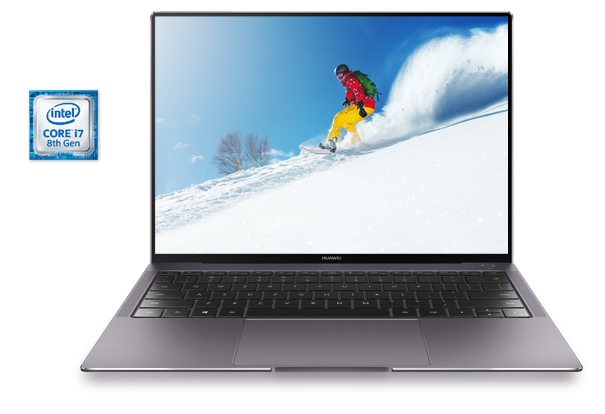 HUAWEI MateBook X Pro maximizes the touchpad, freeing users from the restrictions of time and location. 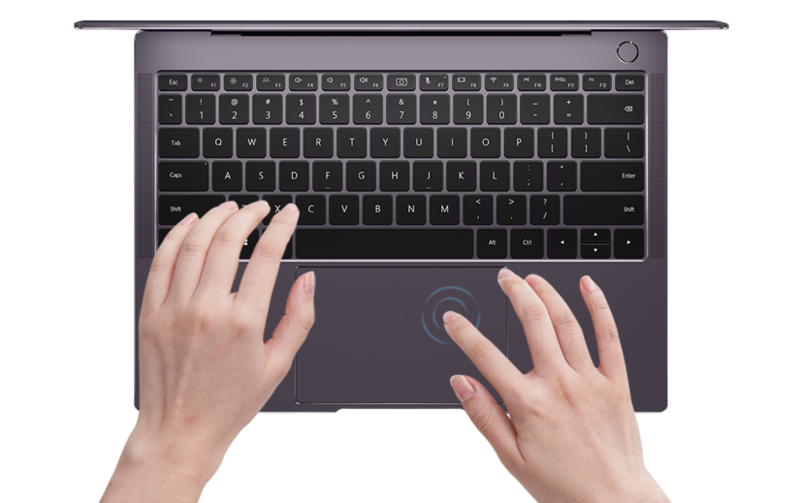 Additionally, Huawei optimized the keystroke and keypad size, giving users more flexibility. The all-new, full-size backlit chiclet keyboard is also spill-proof to withstand whatever life throws at you. HUAWEI MateBook X Pro's one touch power button with optimized BIOS powers up and log in your computer in 7.8 seconds. * Safe, fast and user-friendly. *Includes time to wake up PC and log into Windows. Based on results from HUAWEI lab tests. Performance depends on actual usage. 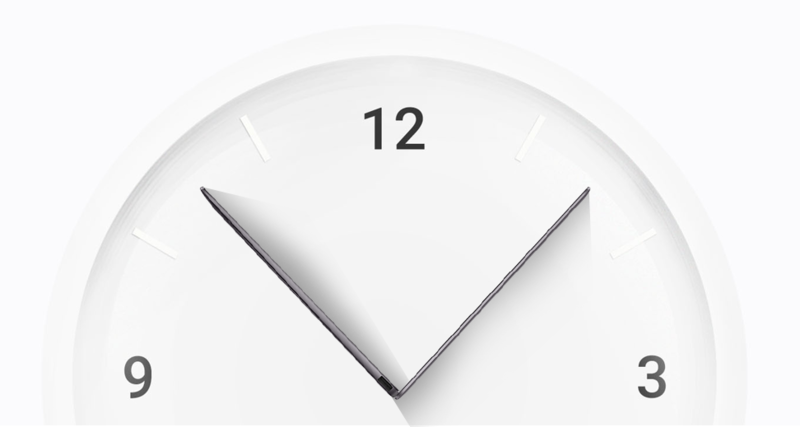 HUAWEI MateBook X Pro has a 3.5mm stereo headset jack, a USB-A port, two USB-C ports including one that supports Thunderbolt 3TM which allows you to connect with a 4K display and external graphics card. It delivers an ultra-thin design with rich ports to power your creativity no matter where you are.